The post Rescuing and Giving Back to Blind Dogs by Nancy Hassel appeared first on Dogster. Copying over entire articles infringes on copyright laws. You may not be aware of it, but all of these articles were assigned, contracted and paid for, so they aren’t considered public domain. However, we appreciate that you like the article and would love it if you continued sharing just the first paragraph of an article, then linking out to the rest of the piece on Dogster.com. He said, “She had a ruptured eye, and the rescue I adopted her from had to remove it. I have had her about four years. She’s a senior girl and now losing sight in her other eye but still as perky as the day I adopted her!” I remember sitting there thinking “Oh, that poor dog” and then looked down at my three-legged dog and realized that’s what people always said when they met my amazing tripod! I asked if she was able to get around on her own or if her blindness caused any issues. “She actually does incredibly well,” he said. “She’s memorized the footprint of our house and our yard so she can get around by herself and not have any issues. It’s really truly remarkable to see. Dogs are resilient aren’t they?” he asked as he patted my dog on the head. I agreed. Tye has microphthalmia, which hasn’t stopped him or pet parent Erica, who adopted three more disabled dogs. Photograpy ©duckycards | Getty Images. A few years ago I met Tye, a beautiful black dog, at an event with his pet parent. I didn’t notice his missing eyes until I got up close, because he was so busy wagging his tail, sniffing everyone and being petted. You know — acting like a dog. Tye is Erica’s first blind dog and her first disabled dog, which opened the door to her providing a home for three other disabled dogs. One of her dogs has a broken back, another is blind and deaf, and another has bladder cancer. I asked Erica what the most amazing thing about having a blind dog is. “It is how a blind dog adapts to being blind. It is amazing to witness,” she says. “So many people never even realize Tye is blind when he’s out in public. 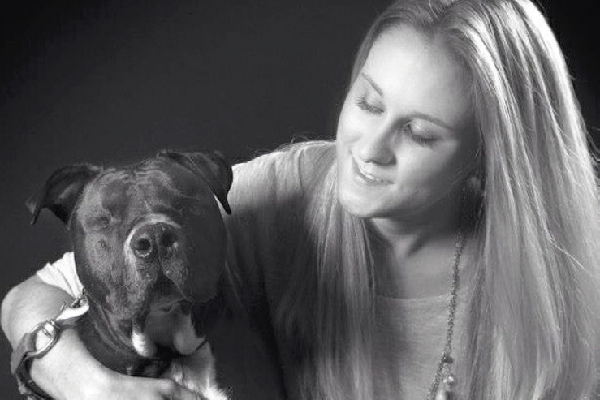 He comes to work with me every day and runs loose with sighted dogs in their yards, and you’d never be able to pick him out as the blind one.” Erica is a pet sitter and co-founder of rescue organization Strong Island Animal Rescue League. “I think people should know that having a blind dog is no different than having a dog who can see,” she says. “They still explore the yard, go up and down stairs, get into trouble and are as affectionate as any other animal.” Don’t treat blind dogs differently than any other dog. How can you help blind dogs? Next time you’re thinking of adopting, don’t skip over a dog because he might be sight impaired. All dogs need a home, and blind dogs will get passed by quicker than a sighted dog. Ask your local rescue if there are any blind dogs you could meet to foster or take for walks to learn more about what it is like having a blind dog. If you meet any dogs who went blind due to old age or who have no eyes, ask the pet parent about them, and get tips and advice. All dogs’ sight can become impaired as they age, just like ours, so it’s best to know any sight impaired tips and tricks. 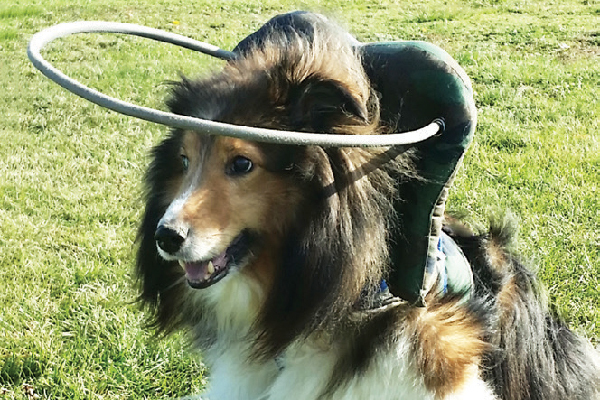 Muffin’s Halo helps keep sight-impaired dogs from bumping into things. If you are thinking of bringing a blind dog home, check out The Blind Dog Rescue Alliance, which has useful information, tips and blind dogs available for adoption. There is also an incredible product that has won many awards in the last couple of years called Muffin’s Halo, which helps keep dogs from bumping into things they can’t see. Learn more about that at muffinshalo.com. CEO and Chief Embracer Laura Bennett also created a nonprofit called Second Chances for Blind Dogs. Thumbnail: Photography ©duckycards | Getty Images. Nancy Hassel is the pet parent of Pit Bull Cody and the president of American Pet Professionals, an award-winning business networking and educational organization for the pet industry since 2009. Nancy travels the country as a speaker, media and public relations specialist, working with pet companies in many aspects including event planning and training for pet professionals. Find her on Instagram and Twitter @AmericanPetPros.